My mother gave me me this mirror that she didn't like "didn't have a place for" in her house. When I showed it to my husband he made it clear that it would not be adorning any of the walls in our house either. He had a similar reaction (as did my running buddy) when I grabbed this hideous a framed print out of a neighbor's trash one morning and brought it home with me. 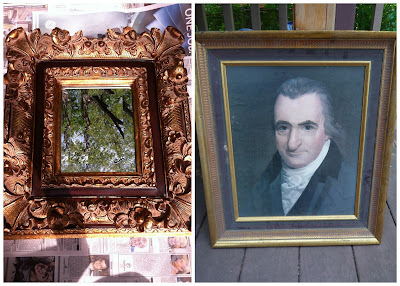 Although I too wasn't keen on the gold frames or the freaky historical figure print (does anyone know who this guys is? ), I really liked both frames and knew they could be transformed with a little paint. So I cleaned them up and spray painted them white (Rustoleum White Enamel). I swapped out creepy historical guy with a piece of foam core covered with the geometric print I used here. I stuck a few straight pins through the fabric and foam to create a place to store and display some of my jewelry. Not only do I love the fresh white paint on both pieces, but I like the way the ornate mirror is balanced by the simple clean lines of the jewelry holder. My husband actually likes the mirror now, and my Mom mentioned that she could have found a home for this mirror in her house. Very cool contrast of the two frames. I LOVE spray paint!